People familiar with the Federal Bureau of Investigation’s programs say that the use of hacking tools under court orders has grown as agents seek to keep up with suspects who use new communications technology, including some types of online chat and encryption tools. The use of such communications, which can’t be wiretapped like a phone, is called “going dark” among law enforcement. The FBI develops some hacking tools internally and purchases others from the private sector. With such technology, the bureau can remotely activate the microphones in phones running Google Inc.’s Android software to record conversations, one former U.S. official said. It can do the same to microphones in laptops without the user knowing, the person said. Google declined to comment. The FBI has been developing hacking tools for more than a decade, but rarely discloses its techniques publicly in legal cases. Earlier this year, a federal warrant application in a Texas identity-theft case sought to use software to extract files and covertly take photos using a computer’s camera, according to court documents. The judge denied the application, saying, among other things, that he wanted more information on how data collected from the computer would be minimized to remove information on innocent people. Since at least 2005, the FBI has been using “web bugs” that can gather a computer’s Internet address, lists of programs running and other data, according to documents disclosed in 2011. The FBI used that type of tool in 2007 to trace a person who was eventually convicted of emailing bomb threats in Washington state, for example. The FBI “hires people who have hacking skill, and they purchase tools that are capable of doing these things,” said a former official in the agency’s cyber division. The tools are used when other surveillance methods won’t work: “When you do, it’s because you don’t have any other choice,” the official said. Surveillance technologies are coming under increased scrutiny after disclosures about data collection by the National Security Agency. The NSA gathers bulk data on millions of Americans, but former U.S. officials say law-enforcement hacking is targeted at very specific cases and used sparingly. Mr. Soghoian, who is presenting on the topic Friday at the DefCon hacking conference in Las Vegas, said information about the practice is slipping out as a small industry has emerged to sell hacking tools to law enforcement. He has found posts and resumes on social networks in which people discuss their work at private companies helping the FBI with surveillance. A search warrant would be required to get content such as files from a suspect’s computer, said Mark Eckenwiler, a senior counsel at Perkins Coie LLP who until December was the Justice Department’s primary authority on federal criminal surveillance law. Continuing surveillance would necessitate an even stricter standard, the kind used to grant wiretaps. But if the software gathers only communications-routing “metadata”—like Internet protocol addresses or the “to” and “from” lines in emails—a court order under a lower standard might suffice if the program is delivered remotely, such as through an Internet link, he said. That is because nobody is physically touching the suspect’s property, he added. An official at the Justice Department said it determines what legal authority to seek for such surveillance “on a case-by-case basis.” But the official added that the department’s approach is exemplified by the 2007 Washington bomb-threat case, in which the government sought a warrant even though no agents touched the computer and the spyware gathered only metadata. In 2001, the FBI faced criticism from civil-liberties advocates for declining to disclose how it installed a program to record the keystrokes on the computer of mobster Nicodemo Scarfo Jr. to capture a password he was using to encrypt a document. He was eventually convicted. A group at the FBI called the Remote Operations Unit takes a leading role in the bureau’s hacking efforts, according to former officials. 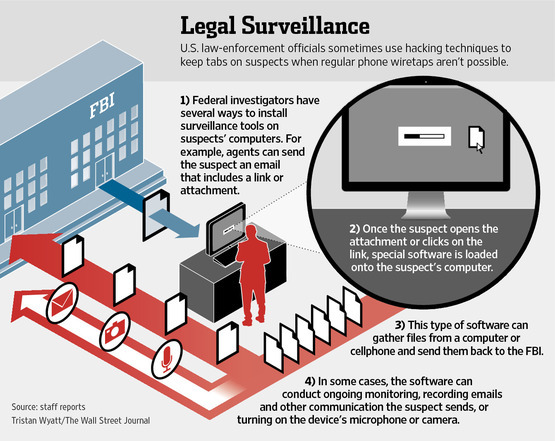 Officers often install surveillance tools on computers remotely, using a document or link that loads software when the person clicks or views it. In some cases, the government has secretly gained physical access to suspects’ machines and installed malicious software using a thumb drive, a former U.S. official said. The bureau has controls to ensure only “relevant data” are scooped up, the person said. A screening team goes through all of the data pulled from the hack to determine what is relevant, then hands off that material to the case team and stops working on the case. The FBI employs a number of hackers who write custom surveillance software, and also buys software from the private sector, former U.S. officials said. Italian company HackingTeam SRL opened a sales office in Annapolis, Md., more than a year ago to target North and South America. HackingTeam provides software that can extract information from phones and computers and send it back to a monitoring system. The company declined to disclose its clients or say whether any are in the U.S.
U.K.-based Gamma International offers computer exploits, which take advantage of holes in software to deliver spying tools, according to people familiar with the company. Gamma has marketed “0 day exploits”—meaning that the software maker doesn’t yet know about the security hole—for software including Microsoft Corp.’s Internet Explorer, those people said. Gamma, which has marketed its products in the U.S., didn’t respond to requests for comment, nor did Microsoft.